You’ll likely to take a guess at a question on Jeopardy. You’ll even guess about what the weather is going to do tomorrow. If you’re really feeling good, you might guess at what your kid is willing to eat for dinner. But no way, no how, would you probably be willing to guess about implant placement, right? You see, the proper placement of an implant is so important to a lot of things. It’s important that it not fail, so it needs to be placed in the strongest, most ideal bone available. It’s important that its position is favorable for the technician, so he can create an esthetically pleasing restoration. It’s important that you deliver what you say you’re going to deliver to the patient, because if you don’t your reputation could suffer. If you’re guessing at the position of your implants, especially on complex cases, you’re asking for trouble, or even worse, a lawsuit. Today, we’re seeing many discerning clinicians opting for guided surgery, versus the more traditional, manual method of implant placement. And that’s mostly because the chances of a successful, predictable outcome drastically increase! While some surgeons feel as if a more analog approach serves them just fine, others are beginning to see the benefits of a guided solution. At Interchrome, we work with our clinicians toward a more guided treatment plan. 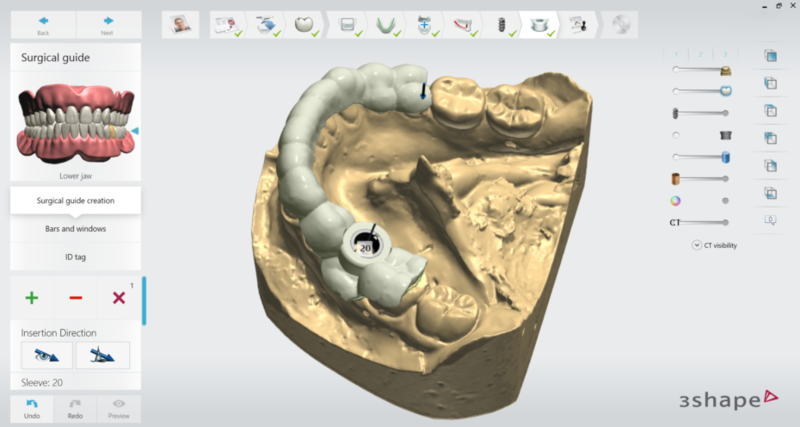 With surgical guides digitally designed via Implant Studio software, we are able to precisely control the elements of implant placement that most often result in undesirable restorative options, and outright implant failure. 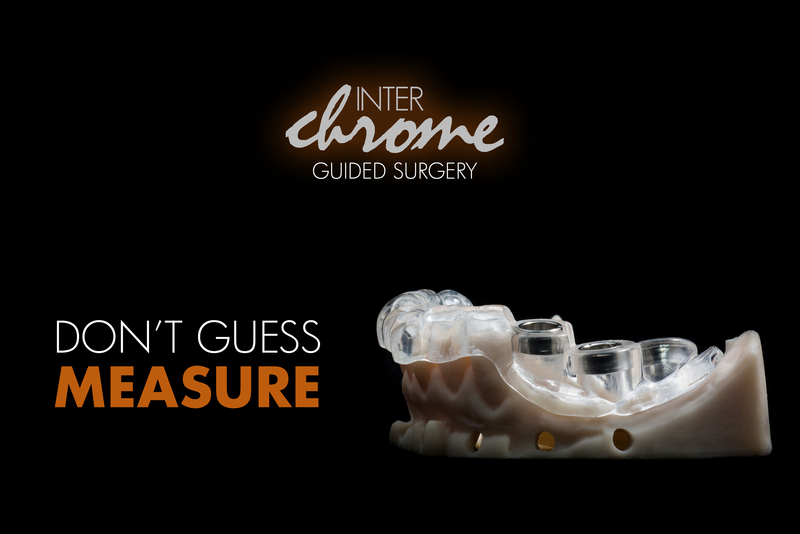 It all starts with a CBCT scan of the patient, and initial impressions of what’s presently in the mouth. 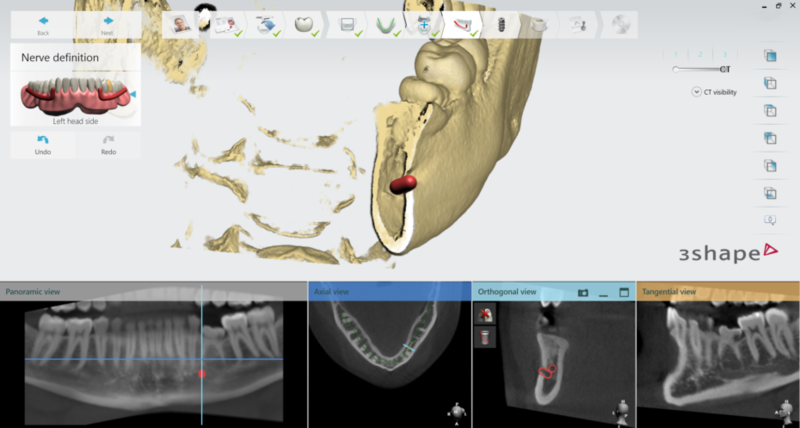 With these two separate types of information, we then combine it so that the software replicates the information in layers that interact with each other, so we can then see the bone available for the implant site in relation to the planned restoration, or position of adjacent teeth depending on the situation. Having this information at our disposal is imperative to improving the predictability of patient outcomes! We are able to plan everything from proper implant depth levels, to fixture width and length, to approximation in regard to alveolar nerves, to even controlling screw access hole placement. From the lab perspective, we’ve come a long way. For years, clinicians and surgeons have requested “guide stents” that supposedly help with implant placement. 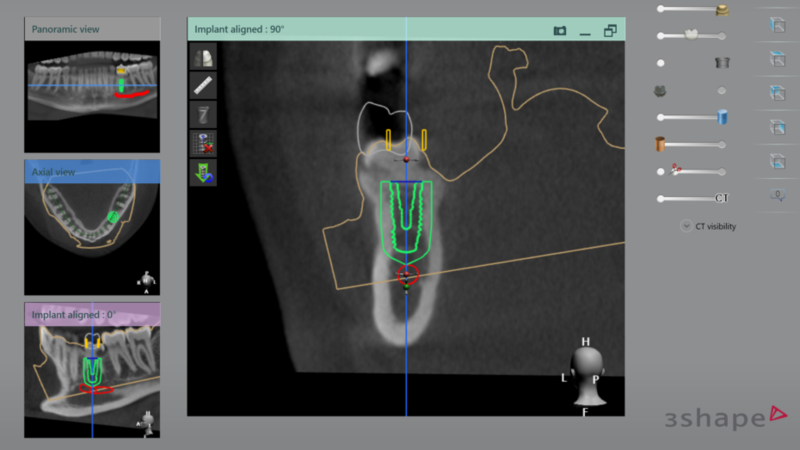 When you see the potential pitfalls of incorrect implant placement to the degree our software now can observe, it makes a technician downright scared to create such a guide that in no way controls these critical elements. They are created merely with a drill through the middle of a waxed up tooth. Where’s the bone? No clue. How close are we to the sinus? Let’s look at the x-ray and guess. These stents of the past are no longer the standard of care. It gets you in the right ballpark, but you have no idea which seat is yours. Case planning for a great result with your technician at Interchrome couldn’t be easier. First, send us your raw dicom files and initial impressions. Working together to plan the case, using Team Viewer which is a free software, both the doctor and technician can see exactly on our computer screens in real time the intricate details that we’re planning. In fact, the involvement of the doctor at this critical step is what ultimately drives the total success of these cases. The technician can hand control of the software to the doctor at any point to make any adjustments they wish, from simply tweaking a depth, or slightly changing an angle or the implant altogether. Once the treatment is finalized, the surgeon signs off on the case, and the guide is fabricated and delivered to the office in a matter of days, along with a full report of parts required, and information the doctor can review about details of the case. This isn’t the future anymore! Guided surgical planning is here, and it’s within the reach of every clinician. It will help make your next case more predictable, successful, and your patients will be happy with the results. Let us help you with your next implant placement. From single units, to complex surgery, our technicians welcome the chance to be of assistance! Call us at 757-271-5811.